Hard water is not uncommon. In fact, it is said that up to 85% of homes in the United States have hard water. Many of these homeowners are treating their hard water issue with the installation of a water softener. Although a water softener can help with the hardness of your homes water and remove slight impurities it doesn’t get them all. In order to remove a greater number of impurities in your homes water along with the sodium from your water softener, it is often recommended to have a reverse osmosis unit installed. The combined use of both a water softener and reverse osmosis systems provides high quality water. The reverse osmosis membranes are delicate. A RO system alone will be inadequate in a home with hard water because of the amount of calcium and magnesium in the water. Calcium and magnesium are the main minerals that make water hard. A RO has a small sediment filter, but it is not nearly big enough to remove the calcium and magnesium impurities that a water softening unit does. Homeowners that install a water softener with a reverse osmosis drinking water system will extend the life of the RO membranes. The water softener/conditioner works as a protective barrier for the RO. Increased drinking water quality is another reason that homeowners should consider installing a whole house water softener and a point of use reverse osmosis system in the kitchen. This allows the water coming from the kitchen tap and the lines going into the refrigerator to be of the highest quality. A reverse osmosis water treatment system takes the water a step further than what your water softener can which helps to ensure the water that you are ingesting is of the purest quality. Another benefit of using a combination of a water softener and reverse osmosis system is the savings in energy expenses, increased lifespan of household appliances, and a decrease need for soap, shampoo, and detergents. 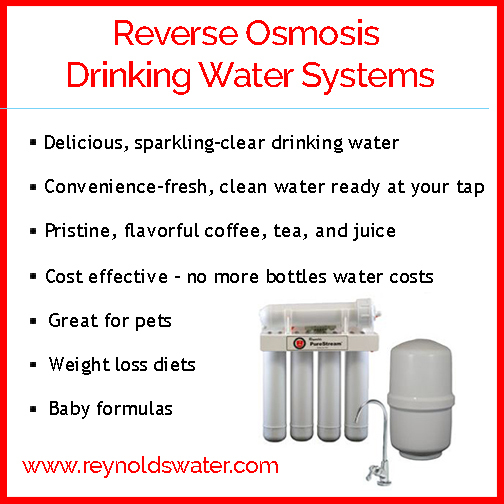 Reverse osmosis systems eliminate the need for bottled drinks which saves families a great deal of money. Homeowners can see how the installation of a softener and RO in combination with one another will reduce household expenses and top-quality water. If homeowners have a whole house water softener installed, consider a RO system that does not interfere with its operation. Evaluate a variety of systems from level of noise they make to how complex filter maintenance is. Using a RO system with your homes water softener allows you to give your family the highest quality drinking water. Who doesn’t want that for their family’s water supply? Next: Next post: Is LASIK Right for You?